| Starting the year at the Double! Home > News > Starting the year at the Double! Here at Inner Circle Training 2017 has started where 2016 left off, with yet more people taking and passing their motorcycle tests FIRST TIME! Despite the recent rain and cold weather resulting in a couple of tests being cancelled, our first 2 module-2 tests of the year saw excellent first time passes for both Mark and Jamie. First up was Mark, who’s been riding trials for a long time but hadn’t ridden on the road for a great many years – since back in the days before CBT when it was possible to ride a 250cc bike on L-plates! He soon got back in the groove, though, and despite a lot of rain during his training and his module-1 test (the following test was cancelled due to standing water!) sailed (!) through the exercises to obtain his module-1 test pass certificate at his first attempt. Unfortunately the weather then changed from rain to snow for his module-2 test on the Friday but we were able to squeeze him in the following week due to a last-minute cancellation. With the weather now the best it’s been all year (not saying much! ), he rode very well to get his full motorcycle licence and of course, the coveted “DAS course completion” certificate! 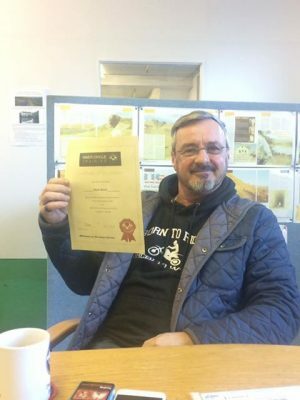 A very happy Mark after passing both his motorcycle tests first time! Following Mark in taking his module-2 test was Jamie. 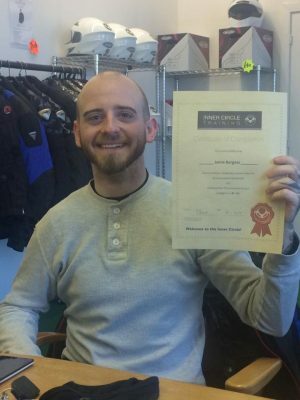 He’d previously undertaken some training with another training school and had a bad experience, so came to us to restore his confidence and improve his riding ready for the tests. He too sailed through both his module-1 and module-2 tests, getting a clean-sheet (zero faults) on his mod-1 and only picking up a couple of minor riding faults in the last 1/2 mile of his mod-2! With a Suzuki GSXR-600 waiting to be MOT’d at home, it’s not surprising that he was delighted with his experience with us! A very happy Jamie after passing both his motorcycle tests first time! Well done to both of them and let’s see how long we can maintain our 100% test pass record for the year!